For the best Volkswagen service, you can count on us at Peterborough Volkswagen! For top-notch maintenance and high-quality Volkswagen Original Parts, Peterborough Volkswagen is your one-stop shop! Peterborough Volkswagen understands the special relationship between an owner and their VW - It’s a Volkswagen thing. We know there isn’t much that frustrates you more than when your vehicle isn’t running as well as it could. Whether it’s regular wear-and-tear or something more severe, our master Volkswagen technicians are well equipped to make your vehicle run like new! In addition to an exceptional team of service technicians executing all maintenance, Peterborough Volkswagen stocks a wide selection of Volkswagen Original Parts and accessories! Our parts specialists are at your disposal to provide any guidance you might require. 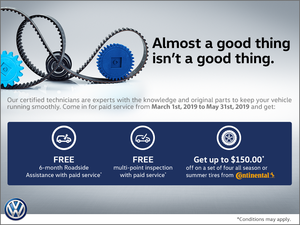 Make sure to check out our special offers page so that you don’t miss out on any potential savings on maintenance or other services. We encourage you to check back regularly, as we are constantly posting great new offers! Lastly, to keep you up-to-speed with routine maintenance, feel free to use our Volkswagen Maintenance Timeline to see what services your vehicle needs and when! Shop our Volkswagen Original Parts and our large collection of accessories to make your Volkswagen even better! You wouldn’t stitch up your clothes with the wrong coloured thread, so why settle for anything less than Volkswagen Original Parts when servicing your vehicle? Coupled with our top-notch vehicle maintenance, Peterborough Volkswagen is proud to offer exclusively Volkswagen Original Parts when you come to us for your service needs! When you bring your vehicle into Peterborough Volkswagen, we treat it as if it were our own. We carry a large inventory of parts and accessories in-house, so when you need something, get in touch with us and chances are we’ve got it in stock! If not, don’t worry - we will order it for you. As always, don’t forget to check our special offers! We constantly offer new ways to save with us. We look forward to hearing from you!